Today I'm in detective mode. My mother showed me this picture yesterday and I want to figure out who these people are and where they were. The first will be easier than the latter, because we have some clues about the people. We are fairly certain that these are some of the same people. It may have even been taken the same day. 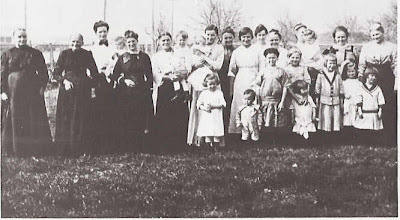 The taller woman in the center who is holding a baby, with a little girl standing in front of her is my great grandmother. I think I know about when this was taken, but if any of you are photo-dating buffs I'd appreciate the input. There is a nice article in the Indianapolis Star about the hubby's youngest brother. It is true that I used to let him win at games. He was five when Colin and I started dating and I wanted him to like me. I've never played golf with him, but he'd beat me at that fair and square. I will, absolutely, be making this recipe. 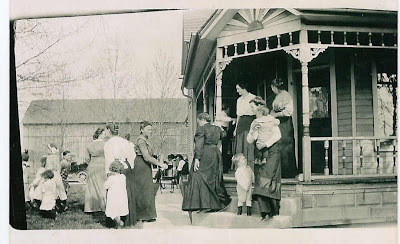 One of my favorite summer time memories from my early childhood was climbing the big wide steps on the front of the Carnegie Library and the going down the stairs to the children's department. I would load up on books to get me by until next Saturday. When I was nine we moved away from my hometown to a bigger city. The bookmobile came to our neighborhood each Friday and I was always ready to swap out my books. When I was 13 we moved back home and I was able to return to my beloved old library. With its cool marble floors and shelves full of books--even across many of the windows--it was my cool, dim refuge on many hot summer days. Now instead of heading down the stairs I could explore all of the nooks and crannies. I have been immersing myself in books. I always have several going at any given time. Right now I'm in the middle of The Perfect Man. I'm reading Jihad Incorporated; A Guide to Quality, Taste & Style; the poetry of John Donne; and Cite Your Sources. Just before Deathly Hallows I read 'Tis. I didn't like it as well as Angela's Ashes. In one of those quirks of library hold lists, when I checked my account tonight I was first in the holds queue for eight books, three of them total fluffy chick lit. That always seems to happen. Guess I'll just have to read faster! I'm not saying much about The Deathly Hallows until a few more of my friends finish it. I'm fortunate to have a family who understands reading from 8:30-3:00 stopping only for brief moments for food, drink, child-hugging and cat-petting, so I was able to finish it Saturday. It helps, too, that we got three copies. We learned our lesson after two of us were trying to read Half-Blood Prince at the same time. It was a very satisfying book, and a great finish to the series. My biggest complaint is that now I'm having trouble reading anything else! My friend, Pastor S., has posted his thoughts about the book on his blog. We have pickles! Today I pickled two quarts and four pints of bread and butter pickles using my grandma's recipe and her jars. The cucumbers are from my garden. I'm pretty excited. I watched people can when I was a girl, but I've never done it before. Now I have 8 jars of my own blueberry preserves, (I gave three away,) four jars of freezer preserves, and my lovely pickles. My cucumbers are going crazy, so I'll be doing more pickles later this week. Tomorrow after I get my haircut and do a mystery shop we have class, so I won't get anything done tomorrow, but Wednesday has to be beets. I was tagged for this meme, about one of my favorite topics, by Not Worthy. Rules: You have to choose one of the two. You cannot answer "neither" or "both." You can indicate that you like both or neither, but you must state a preference. Color or Neutral? What is black? I think that's neutral. Pastel or Vibrant? Umm--this depends on my mood, really! Mostly pastel, I think. Gems or texture? I like sparkle, but most of mine comes from silver. I think I'm more texture. Comfort or fashion? Another hard one....I love fashion, but comfort usually wins in the end. Flip-flops or sandals? Sandals--flip flops make most people shuffle. V-neck or turtle-neck? V-necks are my friends. Long hair or short? On the shortish side. I wish I could do long, but my hair doesn't. Shoulder bag or handbag? Shoulder bag! Now I get to tag some people. Three people immediately came to mind: Bethany, Favorite Apron, and Hoffman Homemaker. Off to the Potter party! We will be among the many nerds, geeks, whatever across the country going to parties while awaiting the midnight release of Deathly Hallows. We should be home about 1:00 with our three copies and the race will be on. I'm at a disadvantage because I have to pickle beets tomorrow. We went out to the 4H fair tonight and walked around. It was a beautiful warm breezy evening. The dust was at a minimum because we've had some rain the past few days. We visited the livestock barns--always my favorite part of the fair--and the other exhibits. I thought about how cool it is that my friend took her turnips to her county fair. We ate pork sandwiches and elephant ears and drank a lemon shake-up. We looked at antique tractors. We went blueberry picking today with RPW, HH, and another friend who--gasp!--has no blog. I have never been before and, although I love blueberries, was feeling a little ambivalent about actually leaving my house this morning. It was well worth leaving the house and the 40 minute drive. It was a gorgeous morning. I finally have enough sun that the freckles on my nose are starting to show. We picked 23.7 pounds of blueberries. Tonight the first eight cups made their way into a cobbler. (More about that cobbler tomorrow.) Most will be frozen, although the eating just as they are commenced as soon as we got them home. I'm also going to attempt blueberry preserves. Tonight was a true summer supper: our zucchini baked with a little olive oil, salt & pepper and cheese; fresh sweet corn from the farm, and blueberry cobbler. I was debating which blog to post this on, and decided since I have some readers who read only one or the other to put it on both. One of the great things about being a homeschool mom is that reading books is part of my job. I have been able to revisit some of my favorites from childhood and young adulthood, as well as encountering many wonderful books for the first time as an adult. I love book lists because they help jog my memory; they remind me of those books that I want to read or reread, or that the kids have not yet read. Tonight as I was catching up with things at Mere Comments, I came across this post. This is a nice book list and the comments have more suggestions. What books do you think are necessities that didn't make this list? Any on the list you think don't belong? On my book list that I used for my children's literacy talks I included a list for preschool. What would you put on that? What books do you think are necessary for basic cultural literacy? I have been, in some strange way, looking forward to reporting for jury duty tomorrow morning. This evening I found out that I don't have to report after all. I was, at the same time, relieved and disappointed. I was relieved that I don't have to give up a day or more of my time, but I was disappointed that I don't get the chance to experience this particular slice of American life. I managed to get my office and my desk cleaned and my bills paid while listening to the streaming video of the synodical convention. Tomorrow I think I'll clean my room, go through a couple of closets, and catch up on a couple of projects at my desk while I listen. I'm finding it fascinating, although not necessarily in a good way. One of our long-standing family traditions is to attend the Indianapolis Symphony's Independence Day concert at Conner Prairie Farm near Indianapolis. The first trip Colin and I made to this concert was 21 years ago when I was seven months pregnant with Bethany. The crowd with us varies, although it always includes my mom and step-dad and my brother and his family. We take fried chicken and little rolls, fresh fruit, cheese & crackers, a few veggies, and of course suitable wine! If we're lucky my sister-in-law, Kim, makes chocolate-covered strawberries. Colin and the kids and I arrive before the gates open to line up with the other die-hard crazy people so that we can get the exact spot as soon as the gates open. We then bake on our spread out blankets--because the temperature is invariably in the 90s--until the rest of the crew begins to arrive a couple of hours later. The concert is generally held on three consecutive nights, ending on the fourth. We usually go on one of the earlier nights, with the fourth as a backup date in case of bad weather. Last year we got through half of the concert before we were cleared out because of a thunderstorm that was on the way. This year Bethany's work schedule made the fourth our only option, because none of us could fathom going without her. As the day drew nearer the weather outlook was looking bad: seventy percent chance of thunderstorms, huge storm systems to the west. I don't usually pray for much of anything, unless it's big. I've always felt like I shouldn't "bother" God with the mundane and trivial. (Although some sermons and Bible studies I've been hearing are getting me past this way of thinking.) But I prayed for good weather. And prayed. And prayed. I told my mom to pray. I told my kids to pray. An evening like this may not seem like it should be that important, but this has been our one consistent family tradition. Everything else has flexed and shifted, but except for the year I was eight months pregnant and living 400 miles away, we've been there. We have had a rough past four months and I think I almost felt like I couldn't lose this, too. Not this year. So we loaded up the car and drove to Indy. We waited in line, with less than a tenth of the usual crowd. We spread our blankets. We bought some kettle corn and we sweated in the heat and humidity. At 6:30 as storm clouds gathered in the west a voice came over the PA system and said, "We are in contact with the National Weather Service, so far so good." We ate our food and settled in for the beginning of the concert. There were more clouds and another announcement. At the intermission a man sitting behind us was talking to someone on the cell phone. He said--and we found out later that this was indeed the case--that the storms had passed about ten miles south of us and about ten miles north. So we got to enjoy our music, our food, the fireworks, and most importantly, our family. I don't know if the beautiful evening at Conner Prairie had anything to do with our prayers, but I felt profoundly grateful. The amount of food that can be grown in one 200 square foot garden is amazing. These pictures are ten days old, so they really don't do it justice. The tomatoes are taller than Andrew now. We have had salads coming out our ears and have given lettuce to friends and neighbors. We've had yummy roasted turnips and a big pan of zucchini.And there's more of everything to come. Today we're shredding up two monstrous zucchinis that got away from us for zucchini bread and muffins. I'm going to feed my mom cucumber sandwiches made with my own cukes. And most exciting so far, I'm going to pickle a couple of quarts of beets, which will give me great juice for pickling some eggs when the beets are gone! If I don't end up on jury duty, we're going to go pick some blueberries next week and mom and I need to get a quantity of cukes so that we can make some bread and butter pickles from my grandma's recipe. Today I need to bake pies for our chicken barbecue and ice cream social. I bought some fresh Michigan cherries when we went to the farmers market, so I'm going to make a cherry pie and a butterscotch pie. I also need to bake a cake, I'm just trying to figure out what kind. This is mostly a nothing post so that my friend Pastor S. doesn't have to see Bethany with the a-blaze orange hair any more. Vacation Bible School has been going on this week, plus my brother-in-law and his wife have been in the states from Australia, and I've actually been working a bit, plus I've had two extra kids in the afternoons, and we had our church council picnic, so it has just been a busy week! I have several photo-inspired posts to come over the next few days. Where better to find "fakes" than on Halloween? I present a fake redhead and a fake pirate. Every once in a while I have to step outside my anti-Oprah box and read a book that has been endorsed as an Oprah's Book Club book. I read them, not because the O. has endorsed them, but in spite of that fact. I decided to read The Road because I thought that the premise sounded interesting. A man and his son are walking south through the barren landscape after some unspecified apocalyptic event. I wasn't entirely sure that I would enjoy it, but figured that I might as well check it out from the library and at least start it to see how it was. I certainly didn't expect that this would be a book that I couldn't put down. I read it in a few hours. I feel like I need to read it again to figure out exactly why I loved it. This is the first book that I've read in a long time that I want to discuss with someone. So if you've read it, tell me what you think.